Pros: We use it in most of our stores. It is working all the time. The direct mail works well. Pros: Information is current. Much success with this product. Pros: Information is current and correct. We can target customers and jump on it. Pros: Easy and effective. Great source for solid leads. We find many past customers who come back. Pros: Many service leads are found and this tool is very productive. Pros: Have only had a few weeks and we have found many repeat customrers. Pros: This gives them a quick and easy way to approach the customer while in service with a professional handout customized for that customer. They also can do marketing based on criteria and give each customer in the area a reason to come in and buy. Another tool that we see ROI on month after month. 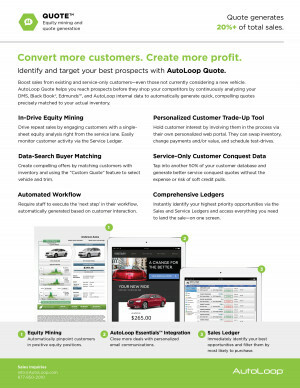 Now that it feeds into the AutoLoop CRM all my salespeople have even more visibility and ways to present to customers. Pros: Customers love this option and so do the salespeople!